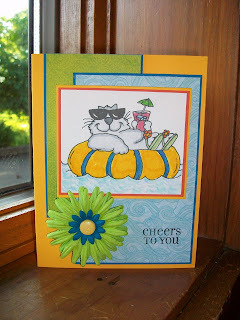 I made this card for CC224-Pacific Point, Tangerine Tango, and Summer Sun. In addition to these colors I used K & Co's Cintronella paper. 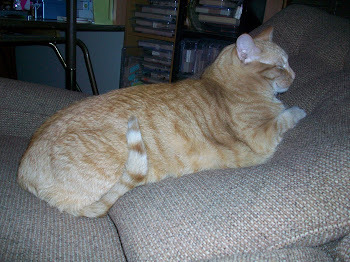 The cat image is a free digital stamp from Hambo Stamps. 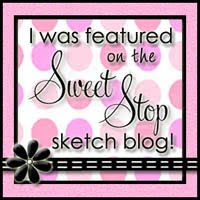 If you haven't yet tried digital stamps, they are fun, inexpensive, and easy to use. The image was colored with Copic and SU markers. The layout of this card is SC229. This card will be sold this weekend at the open house for the no-kill animal shelter where I volunteer. Here is my submission for SCS LSC225. 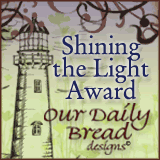 For this challenge, we were to use an international print stamp. I had to look high and low to find a stamp in my collection that contained print that was not in English. 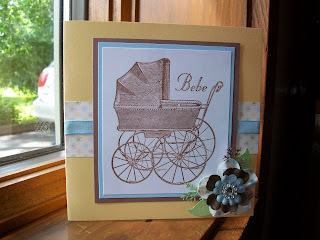 I chose to use a Bebe carriage stamp from Artful Illusions. This card also meets the color requirements for CC213. The colors used for this card are So Saffron, Close to Cocoa, Bashful Blue, White, Certain Celery, and SU Delicate Dots DSP. I topped the card off with Bashful Blue ribbon and a layered Prima flower.